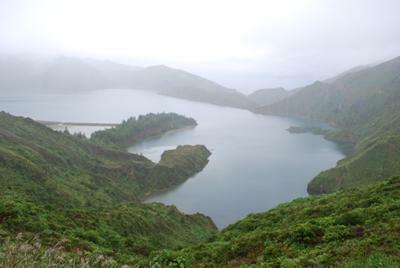 Breathtaking and magnificent view of Lagoa do Fogo even through the fog. A must see on a visit to the island. From Rob: I agree! Thanks for sharing your beautiful picture! Just back from Cancun for 2 weeks in the sun! Love this picture. Thanks for sharing! Sure hope to get to see you and all the beautiful sights in Portugal someday. You can be our tour guide! A Beautiful photograph of a beautiful place! It looks beautiful. I would love to go there. The beautiful Lagoo do Fogo, I would love to go there. One senses a very peaceful feeling about being there. As always, beautifully framed photo! Hope to someday see this place myself. Will plan to include it on our next trip to Portugal. Brings back memories of my visit there. Miraculously, had luck to see it without fog! Have been to Portugal, but never to Lagoa do Fogo -- it looks like a place I would like to visit. Fog or no fog, I'd love to be there right now! "...tanto silencio confiado ah luz!..."